In the world of the iPod-compatible speaker systems, the iLuv i399 is a jack-of-all-trades. This bookshelf unit not only plays back audio from your dock-connector iPod, it also sports an FM radio, a line-in jack, and Bluetooth audio (via an included Bluetooth adapter). Unfortunately, this slew of features is offset by lackluster audio performance and technological limitations. The i399 is large: at 19.25 inches wide, 7.5 inches tall, and 7 inches deep, you’ll want a decent size bookshelf for it. And popping an iPod in the Universal dock increases the overall height by an inch or two, depending on the iPod. The system isn't very heavy, though, and there are convenient handholds on both sides for when you want to schlep it around. A small remote control and an AC adapter are included, as are four dock adapters—for the 30GB and 60GB fifth-generation iPod and the first- and third-generation iPod nano. The majority of the front is taken up by a large, mesh speaker grille which conceals left and right 3.5-inch speaker drivers. Along the top edge, to the right of the iPod dock, is an LCD display that shows the time and current audio source; just in front of that is the unit’s main control panel. (Despite the clock, the i399 does not feature any alarm capabilities.) To the left of the iPod dock are two small doors: the left-hand one flips open to reveal an auxiliary line-in jack and a headphone jack; the right-hand one hides a connector for iLuv’s proprietary BluePin Bluetooth adapter. On the unit’s back are two battery compartments: one to supply the unit’s main power (a staggering eight D cells) and one for the clock's backup cells (a pair of AAAs). No batteries are included with the unit. There’s also an extendable, swiveling, metal antenna for the i399's FM radio. Finally, on the bottom are a subwoofer—using a nearly-4.5-inch driver—and a blue accent light that pulses in time with music; you can turn off the latter by holding the Mute button for three seconds. Playing back iPod audio is easy enough: pop the iPod in the dock, hit the Mode button on the control panel, or the iPod button on the remote control, and you’re off and running. The iPod charges as long as it’s docked in the unit. You can also charge and play an iPhone, but the i399 isn't shielded against GSM interference, so if you're on the EDGE network, you'll definitely want to switch the iPhone into Airplane Mode to avoid audible interference. The i399 sports playback controls on the top of the unit, but they’re no more convenient than using the iPod’s own. In fact, the i399's buttons may actually be less convenient, since most are small circles with labels that you can read only close up—you have to hunt and peck to find the play/pause button while the iPod's is easily available a couple inches away. The exceptions are the volume up and down controls and the search/skip controls, each of which have an indentation for the “down” direction, and the Power button, which is much larger than the others and positioned by itself all the way to the right. The i399's audio quality is decent, but it won’t knock your socks off. The dedicated subwoofer boosts the low-end adequately, but I didn't find the treble to be especially clear. I also ran into a problem with interference when an iPod was docked, the result of which was a quiet but noticeable high-pitched squeal. I could usually drown out this sound by turning up the volume, but during quieter pieces, or when the iPod was paused, the noise was clearly audible. 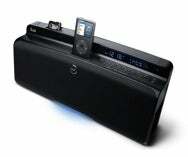 The issue remained regardless of the iPod or power source. The auxiliary line-in jack is useful for hooking up a laptop or a non-iPod MP3 player; the sound quality when listening to such a source is good. Likewise, the headphone jack is a handy addition. FM radio reception is decent, thanks to the adjustable antenna, but the radio preset system leaves something to be desired. Despite having twenty preset slots, you can flip through presets only sequentially, by hitting or holding the preset button, meaning that if you overshoot your desired station, you have to go all the way around again. The marquis feature of the i399 is its Bluetooth capability. The included BluePin Bluetooth adapter is about the size of a car key fob and docks in its own port on top of the unit. (The adapter is also compatible with other offerings from iLuv.) With the BluePin in place, the i399 is capable of both sending and receiving audio via Bluetooth. You can toggle whether the BluePin is sending or receiving by pushing a button on the side of the adapter. I wasn’t able to test the transmitting features of the i399—you’ll need a pair of Bluetooth headphones that support the A2DP profile to take advantage of it. The receiving feature, on the other hand, has a couple different uses: You can pair an A2DP-compatible device with the i399 to send audio from that device to the i399 and you can pair the i399 with a mobile phone to use it as a speaker phone. Macs running Leopard are actually capable of outputting audio via Bluetooth A2DP, so I paired the i399 with my MacBook. Once you’ve done that, the system appears as an output in the Sound pane of System Preferences. Sound quality over Bluetooth wasn’t quite as good as piped directly from the MacBook's audio-out jack—I noticed a bit of static and distortion in louder parts of songs—but it’s similar to that of other Bluetooth audio solutions I’ve tested. When it comes to the phone functionality—I paired the system with my iPhone—the i399 leaves a little more to be desired. In my tests, while I could usually hear, clearly enough, the person I was calling, I often had to jack up the volume to do so, which means that when I switched back to playing music (which happens automatically after ending a call), audio was extremely loud. The integrated microphone on the i399 is also sub-par; one person I called said I sounded like I was at the end of a long tunnel. In other words, the speakerphone feature is usable, but not impressive. Overall, the i399 is an okay speaker system with a lot of options, but it’s hard to recommend wholeheartedly with the audio interference issue and lackluster phone performance. While the i399 may be a jack-of-all-trades, it seems that it’s also a master of none.